I love ginger, spices in general, cooking, so why wouldn't I like to grow my own. For years, I have been wanting to grow my own ginger. I do grow Canadian Ginger (Asarum canadense) which is a native perennial. Many people ask if it is ginger (the spice). No, nothing like it, completely different species. 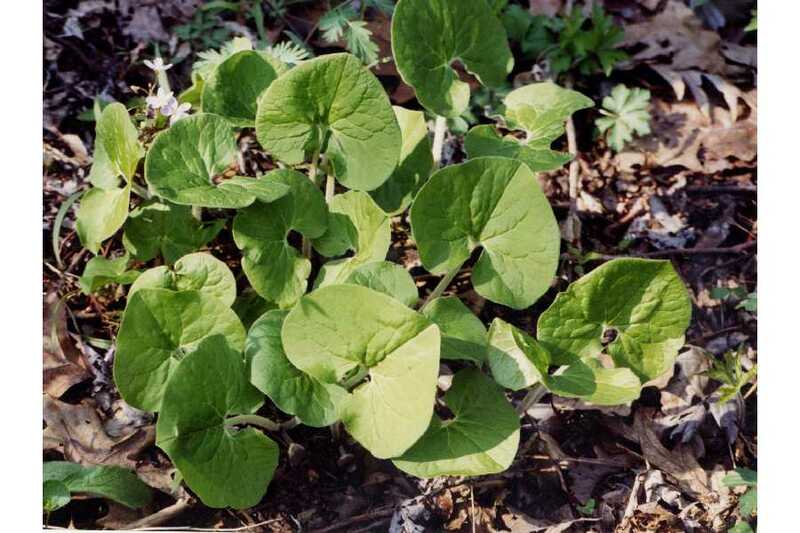 In fact, even though the Native Americans used it medicinally, it is also reported to be a carcinogen. I'm not trying it. Ginger (Zingiber officiale) is surprisingly easy to grow and you do not need to spend much to get some. Hence my tale.... update to a post on my Facebook page. In October or 2015, I purchased a piece of ginger at the Seaport Farmer's Market in Halifax complete with a nice sprout. I had been looking for a piece of ginger like this for some time. The young man selling the ginger pointed out that I could plant it. Yes, that was exactly what I plan to do. Cost: approximately $2.50. Max. Went further into the Market and found fully sprouted ginger. Paid $5-6 for this piece, it was 1/2 the size of the first piece I bought. And it was selling fast, they had a whole table of it. At that price, they were making good money. I figured one or the other would give me a pot of ginger. 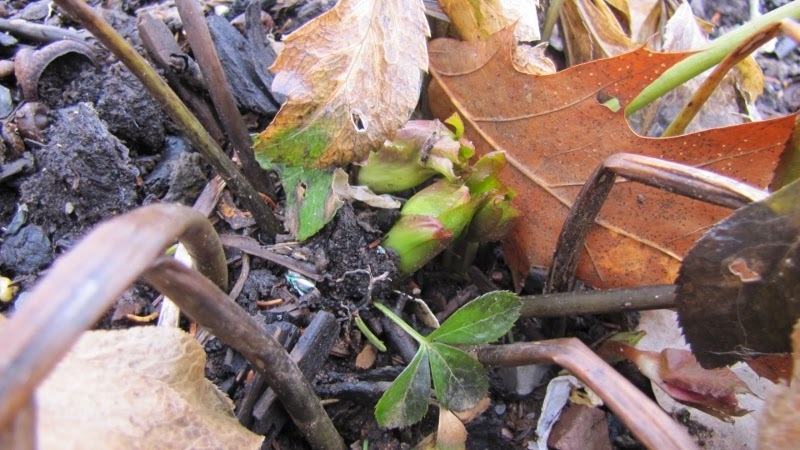 I planted the fully sprouted piece, over the next two weeks, the nice green shoots gradually died back and as of today (January 2016) I have not seen anymore green shoots. It is just sitting in the pot on the window sill, getting a bit of water from time to time to keep it moist but not wet. I'm not holding my breath it will grow, but I do have hope. Eternal optimist. Perhaps I should have cooked with this one. However, my cheap, regular old ginger, and I did not even plant all of it, sprouted and grew wonderfully, it is currently sitting near the window in the winter sun. I will re-pot it the spring when I have more heat on in the greenhouse and see how it goes. If you just google growing ginger as a houseplant, you can get more specific instructions. I don't know about growing it outside in the ground. I would assume if you did plant some in the ground, it would need to be dug in the fall and treated as a tender bulb (rhizome). But it would be fun to try. Seen a picture of a turmeric plant somewhere on Facebook last year, I think. Want to try that too. Anyone have a piece?? Any one who knows me or has heard me give talks on gardening, knows I'm passionate about compost (wrote 2 blogs on the subject in 2011). 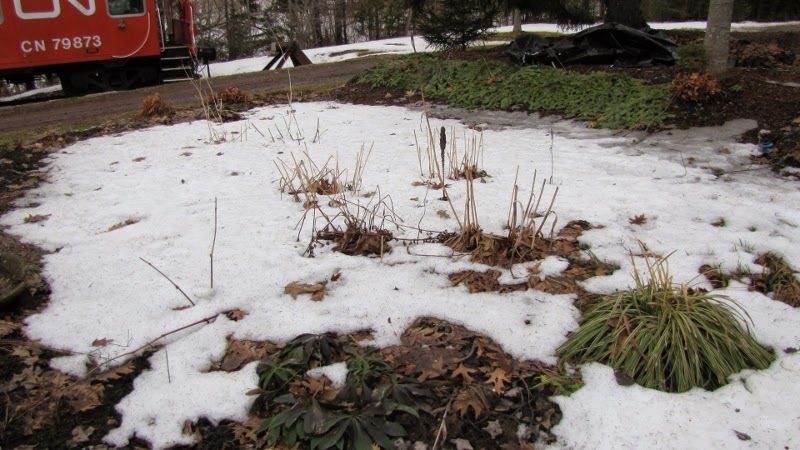 What has got me on to this post is the mention of the build up of compost in bags on the back deck of homes, because no one can get to their compost bins or piles or the use of snowshoes to get to the compost pile on the NSAGC Facebook page. 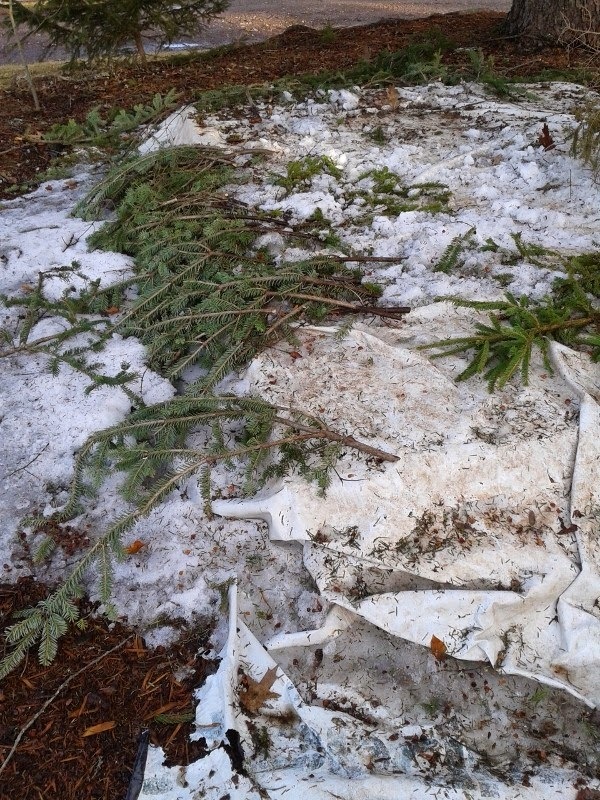 This is the first year, I have ever had to resort to snowshoes to dump the compost. And thank goodness for snowshoes, I did not feel like hip wading through 4-5' of snow. We just purchased 2 pair this year, I did not know how much fun they are. I had an old type made of wood, but found them too big and clunky. These are perfect. Of course the compost piles up under the counter, mostly coffee and vegetable peelings, but it has to go. I don't use my Municipality's green cart. What I can put in my own compost I can; scraps (bones, bits of meat) - the dog gets, old bread - the crows. I don't waste food, I try to find a use for it before it goes bad (freeze it for later) or just don't buy what you don't need. It's a long trek to the compost down below the vegetable garden, beside the wood shed. Doesn't seem that far when there is no snow. And the snow is relatively firm after all this cold weather, but I know if it wasn't for the snow shoes, I would have a much more difficult time. The bin on the left is finished compost for this coming year. All the bins are 5' in height. There is plenty of snow around. Well that job's done. There have been several treks to the piles but it is all worth it. 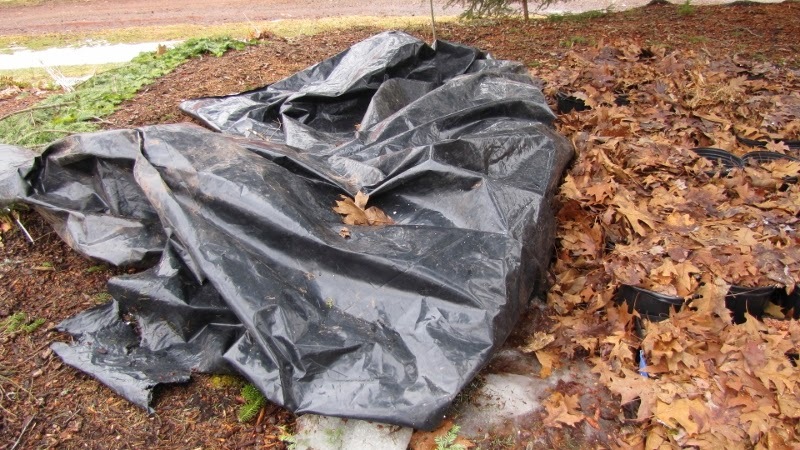 This compost goes in my vegetable garden because I know what I put in it. 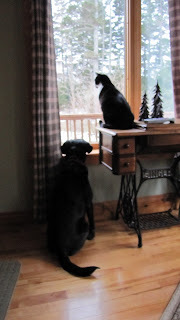 As I write, it is snowing again. Will it ever stop?? Hi, it has been awhile. I obsess way too much about what to write and finding the perfect pictures. I know, write what you know. 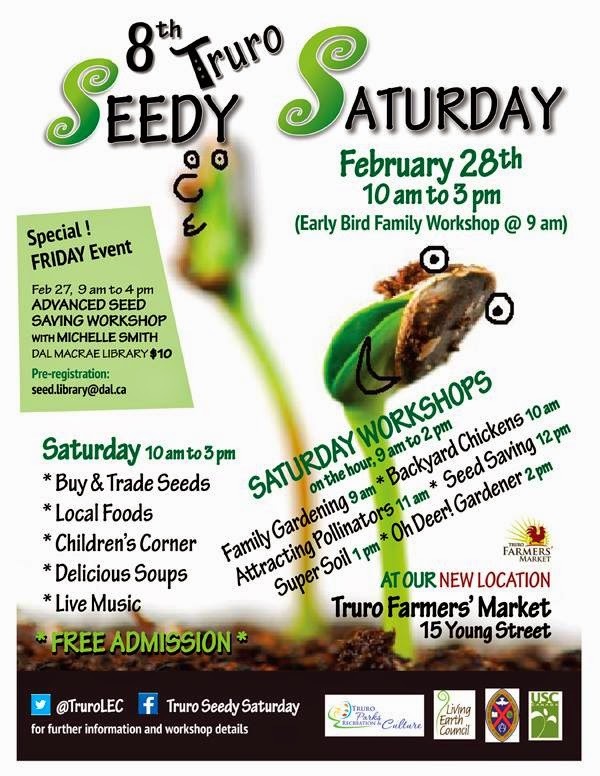 This weekend, myself and fellow gardener Lana Blos (under the direction of Susan Corning) is giving a talk at Seedy Saturday at the Truro Farmer's Market on Family Gardening. How to encourage families to garden together. 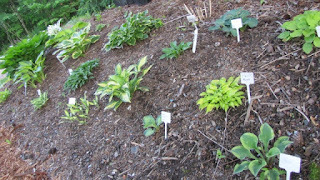 There has been a great serge in interest in urban/suburban vegetable gardening. 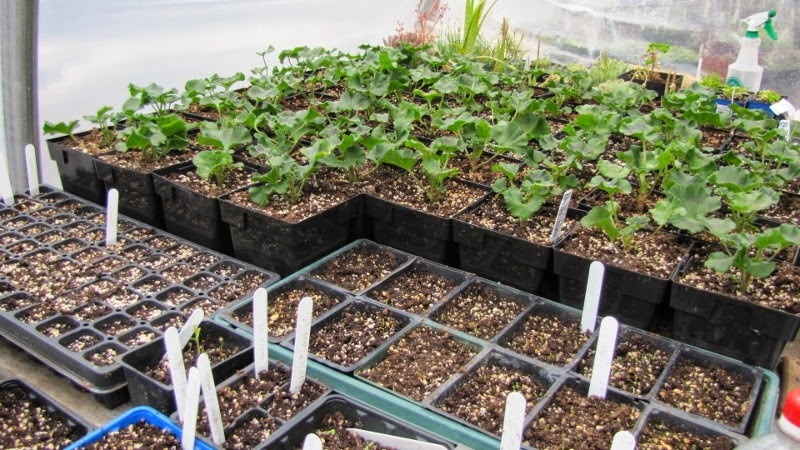 It is actually quite easy to tuck a few veg plants here and there among the planters on the deck or the flowers in the garden even if space is limited. 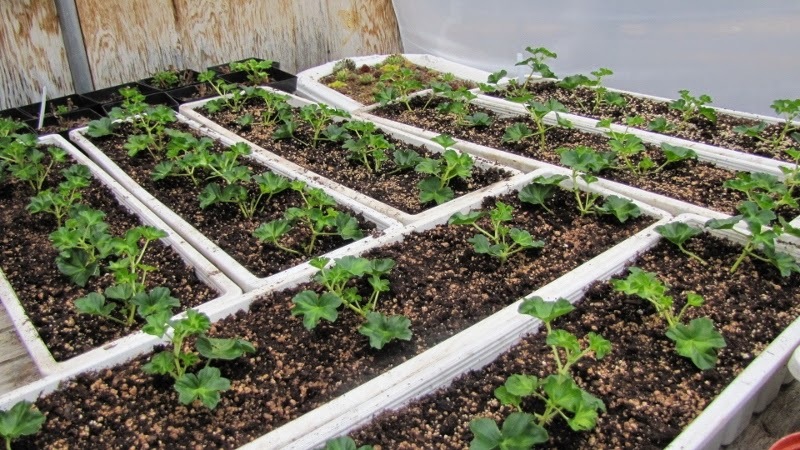 Many vegetables are easily suited for container such as tomatoes, peppers, greens and herbs and may companies are producing seed specifically for containers and planters. I know two people whom grew squash in a large container with a trellis and had very good results. They learn how to design, planning, planting, maintaining, harvesting and sharing skills. They learn about science, become environmentally aware, understanding the interactions of nature and how it works, how insects pollinate, how a seed grows, understanding that sun and rain makes things grow and there needs to be balance. The idea that you put a tiny seed in the ground and in a few months you have carrots, tomatoes, flowers. They have exposure to healthy food, actually knowing what a vegetable looks like and how it grows and just doesn't everything taste better when you grow it yourself. Children are more likely to eat them it they grow it themselves. We are learning more all the time about how important fruits and vegetables really are to our diet. There have been many studies indicating this. 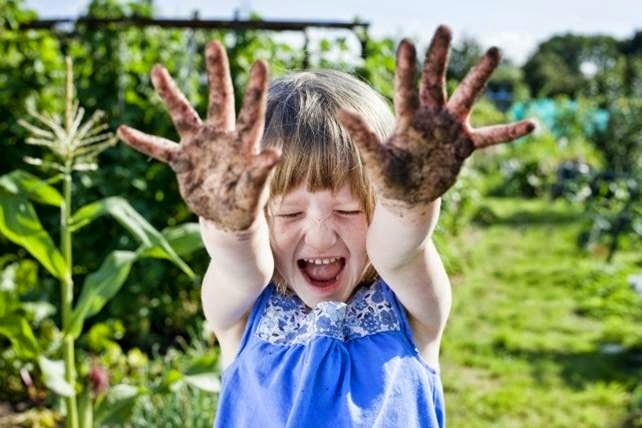 There are also studies suggesting that gardening when young increases the exposure to pathogens that help build up our immune systems to help us fight off chronic diseases and mental problems when we are older. There can not possibly be any disadvantages. Can there? They are going to get dirty. 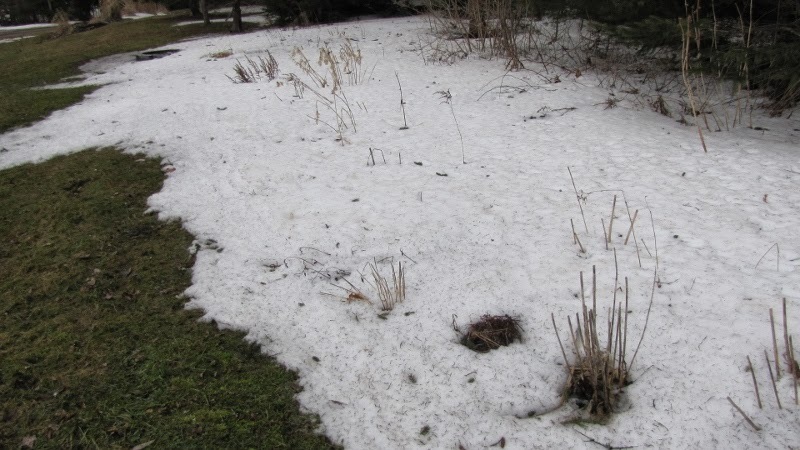 I am sick and tired of winter. 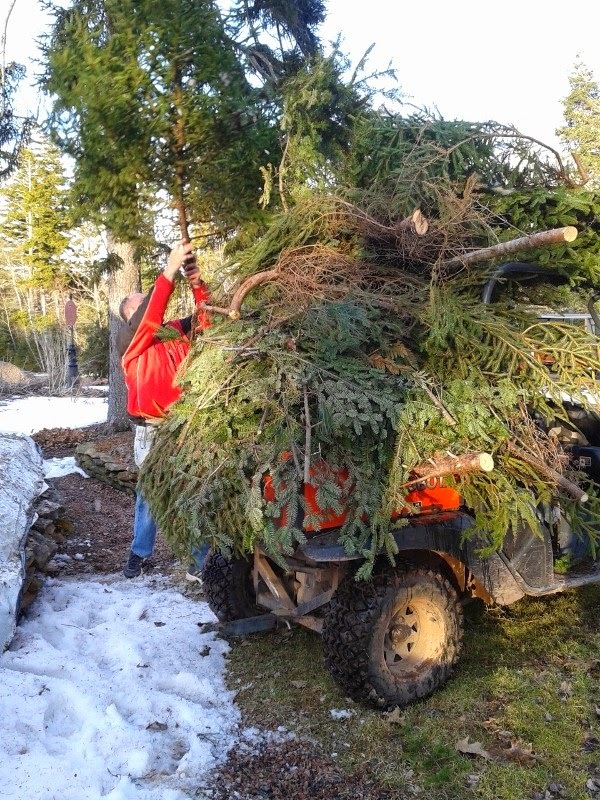 I know tomorrow is supposed to go to 10 C.
Andrew was determined to get every piece of brush on the buggy. Didn't happen. 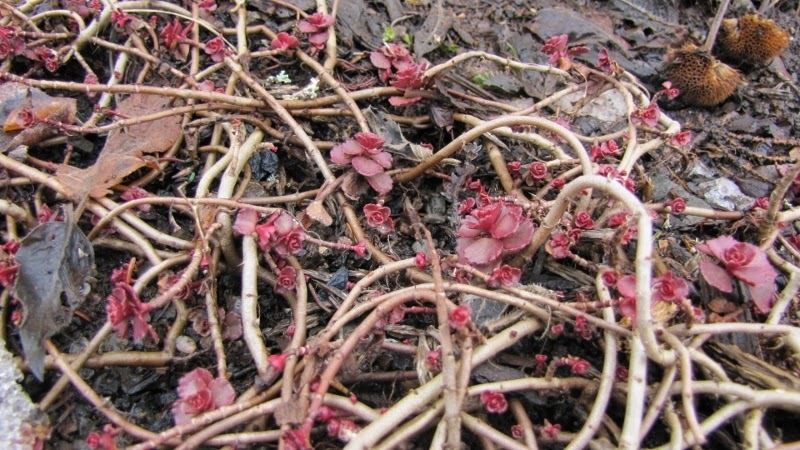 Sedum, Red Carpet, survived quite nicely. Monarda, Beebalm, smells so good. Erythronium, Dog Tooth Violet, Pagoda, is a cultivated version of our native Trout Lily. They came up quickly in the greenhouse and are almost in bloom. The cooler outside temperatures are helping to slow them down. Everything is moving along nicely, the tomatoes and peppers have just started to germinate. It seems too early by the weather, yet I feel it is too late by the calender. And maybe try not to be too cynical. 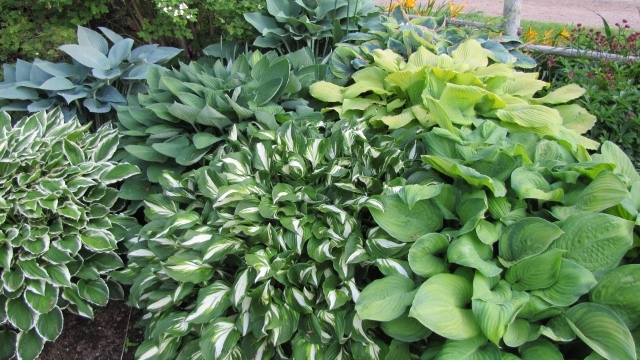 The lush clumps of bold, exotic leaves are their main feature. Flowers are an added bonus. 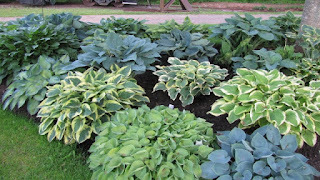 They are dependable and reliable plants that brighten up shady areas. 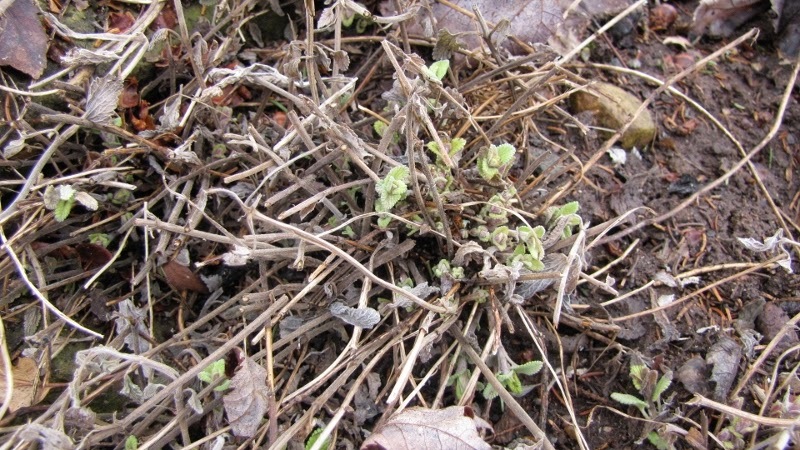 The leaves may be variegated blue-green, gold-green. white-green, two toned, three-toned etc..., solid green, blues, gold, as well as various shapes and sizes, forms, leaf textures. They range from 4" miniatures to 6' giants. 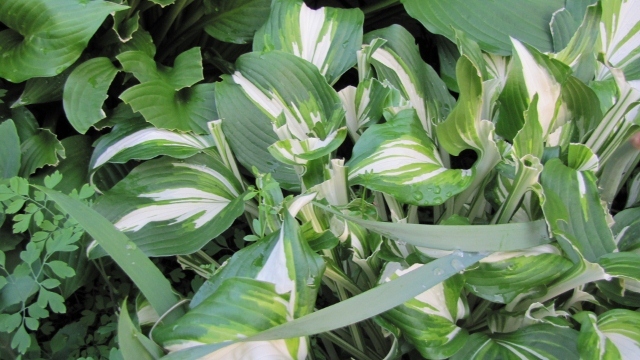 You describe your ideal hosta and it is probably out there. 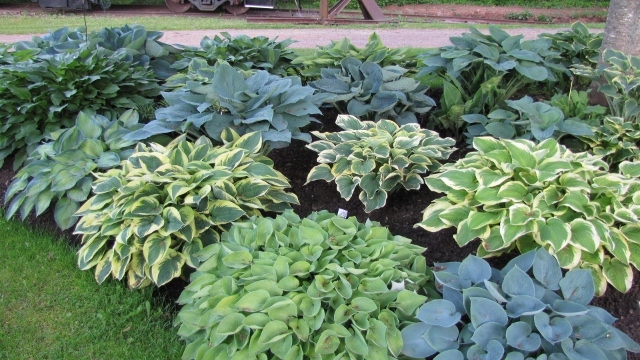 After all, there are thousands of varieties on the market now and more coming. Can you grow them in the sun? Of course, but they need moisture. Nothing a few good scoops of compost won't take care of. 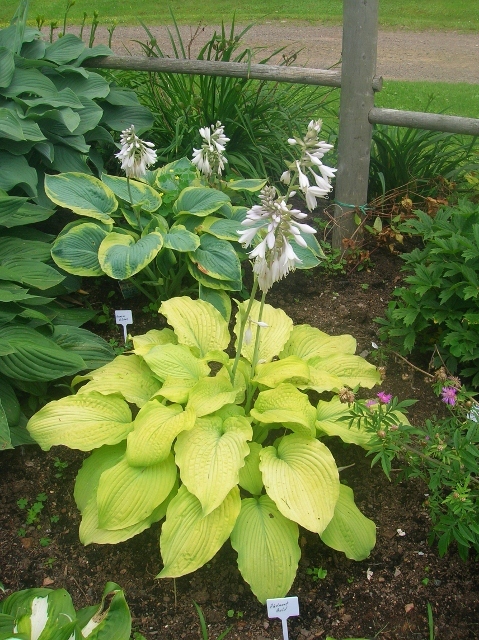 Generally speaking, the yellow leaved hosta are best located in the sun, they maintain their yellow-gold colouring and contrast nicely next to perennials with darker green foliage. Blue Hostas need at least afternoon shade. If planted in an area with afternoon sun, they will grow, but will loose there beautiful blue colouring. The sun can scorch off a waxy layer that gives the blue hosta its colour, rain or rubbing against other plants can also cause a mottling appearance. 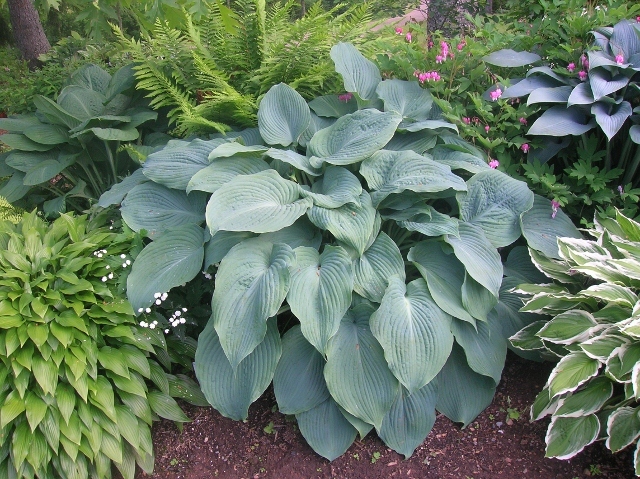 Blue hosta can grow in complete shade. 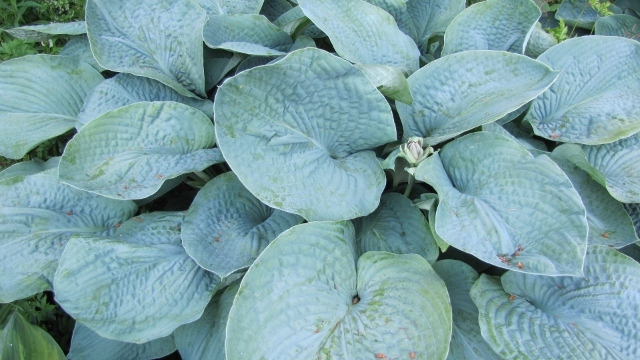 And after all, if you are seeking out blue hosta, let's keep it blue. The flowers range from mauve to lilac-lavender to pure white. Some are even fragrant. 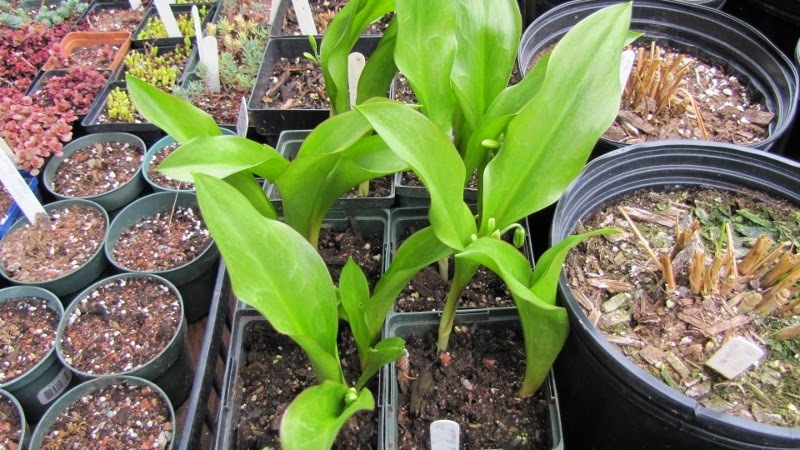 They rise 1-2" above the plant opening to elegant lily-like flowers. Many of them are prized by floral arrangers. The perfect plant? 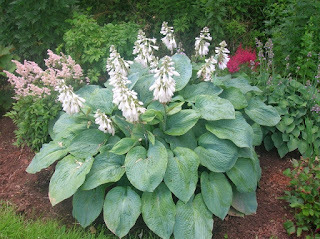 Hosta collectors think so, and some of them can be a bit obsessive, but with thousands of varieties out there, they can keep collecting to their hearts content. The problem I find is some of them look so much alike. One draw back may be that the slugs find them an irresistible treat. Here in my garden Ligularia Desdemonia and Britt Marie Crawford are the irresistible treat. 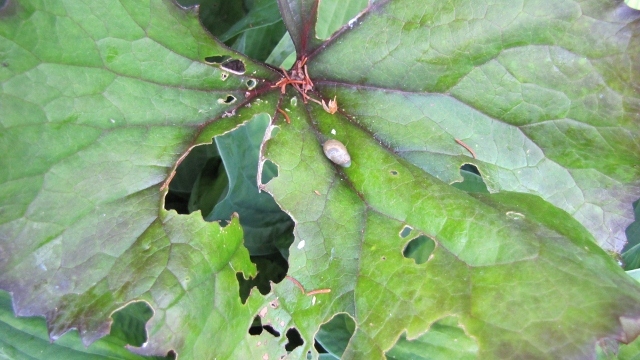 The slugs and the snails devour them . Generally speaking, I don't mind the few slug holes I find. 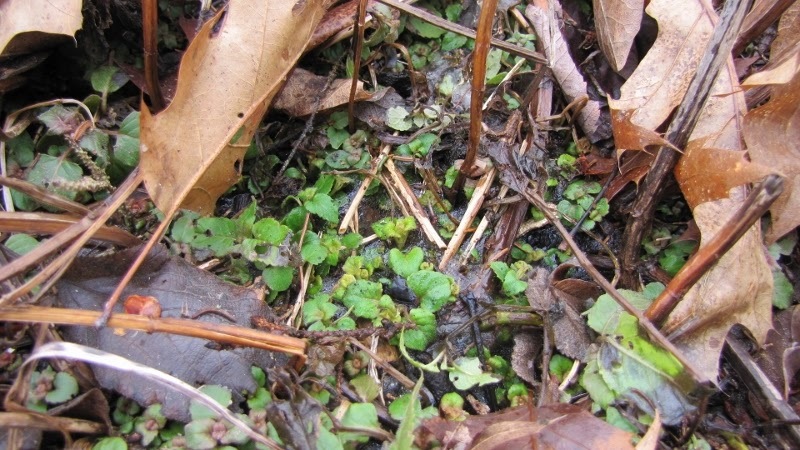 It may be more of a problem when the plants are small. However, some varieties of Hosta are more resistant than others. Generally, the thicker the leaf, the lest likely the slugs will like them. Also some of the bluer hosta are not as appealing. You don't see too many holes, if any in the blues. 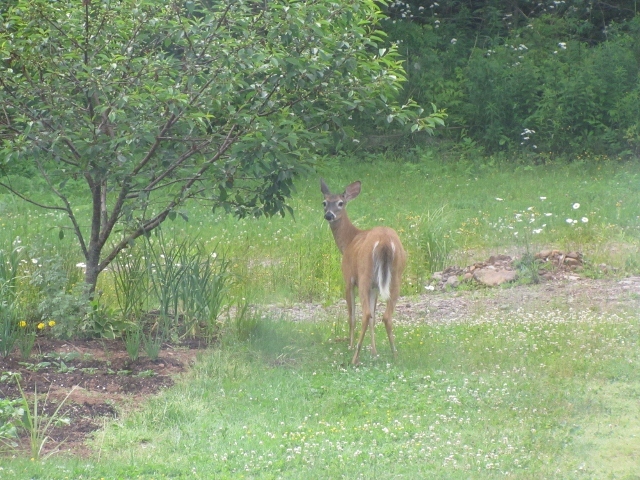 Deer are a second problem, at the Farmer's Market in Truro, not a Saturday morning goes by without some one complaining about the deer eating their hosta. They are far more of a problem in towns where it is not uncommon for you to look out your window and see a deer looking back in. A friend describes being wakened in the night by a 'rippppp' then a 'chomp, chomp, chomp..' and looking out the bedroom window, nose to nose with a late night snacker. I don't have deer problems (knock on wood) and you would think I would. 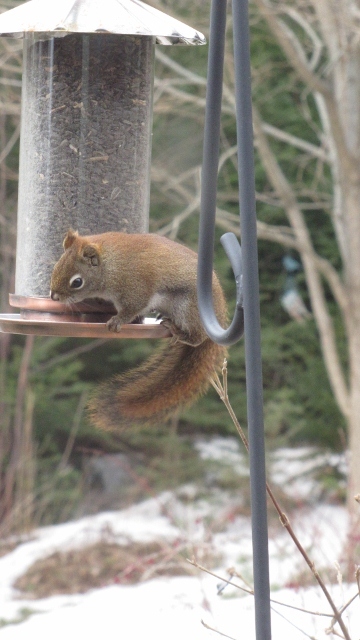 They have eaten my beans in the veggie garden, the tips of my cherry tree, and the crab apples in the fall, but they have not touched my hosta. Is it because, out in this area, we have hunters in the fall and they are scared of us? or there are many farmed fields full of lush forage crops. 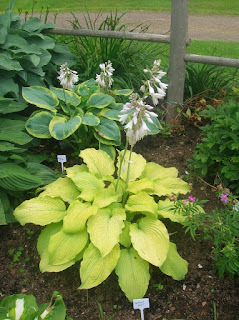 What ever the reason, I will count my blessings, and my hosta. And can they quickly fill in, this bed drastically needs to have them divided either this fall or next spring. On the other hand, minis can solve that problem. 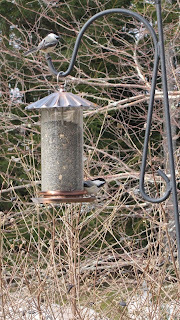 Small, cute and easily divided with a trowel or small shovel. Deer maybe an issue, but at least they have good taste. I don't mind the squirrels at the bird feeder except when they scratch up the window frames. We put a new window in last fall and I just happened to get a new bird feeder last fall also. The new window frame is made of Fiberglas. 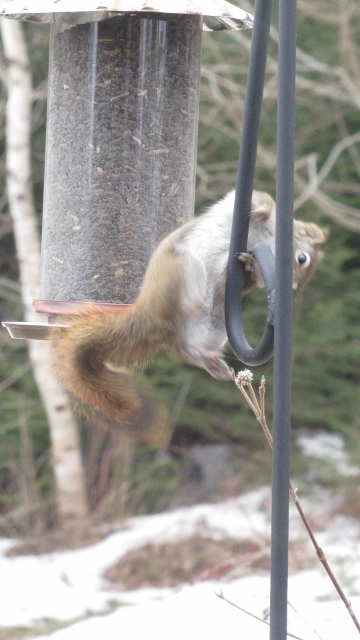 The squirrel just can't get a grip. 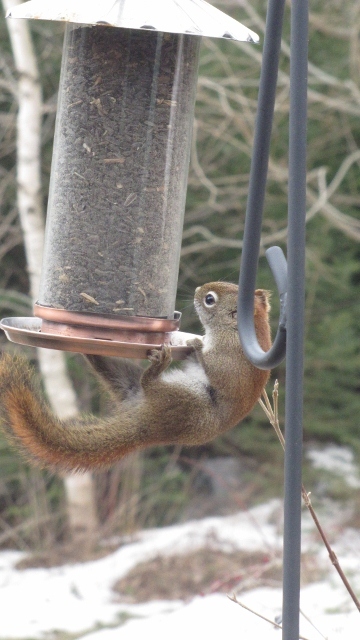 So he scampers up the cedar clapboards and makes a lunge for the feeder. 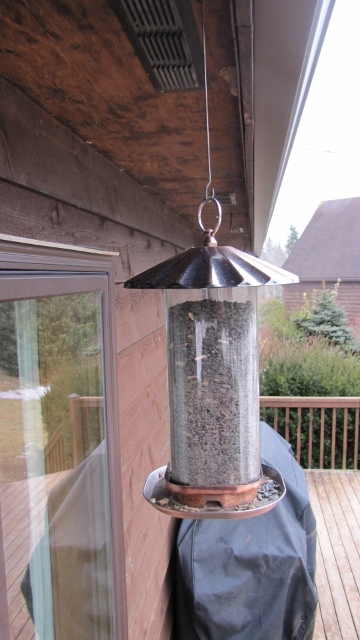 He gets on top, but because the top is metal (fake copper, it is already starting to rust) he has a hard time hanging on, and he can't figure out how to get around the top and down to the seed. He usually drops to the ground and at least gives it one more go before giving up, and heads back to the woods. 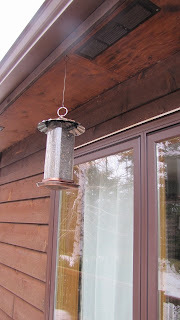 Who needs one of those $100 fancy squirrel proof feeders, mine cost $15, even though it may not last that many years. It would have been awfully cute to actually get a picture of him going through this, but I think he has given up. Andrew bought me a new poll for Christmas. 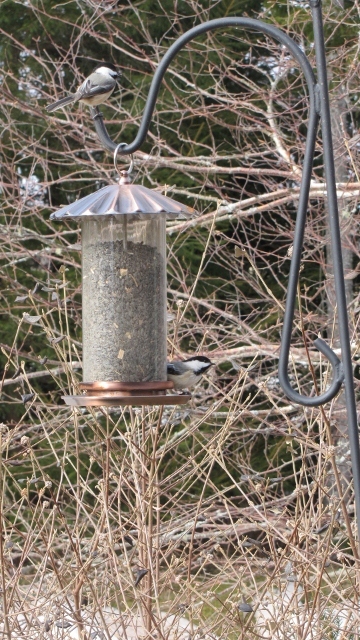 He attached it to the railing where we could still see the feeder from the house but where there would be less mess against the window from the birds. 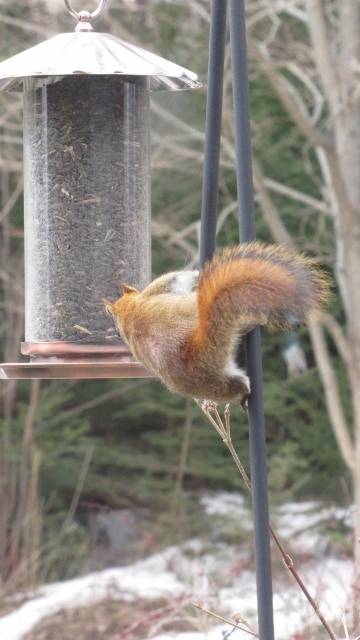 The squirrel found it and yes he can get to it. The feeder is designed that although he can get on the ledge of the feeder, he has problems staying there for any period of time. So it is grab and go. At least they have entertainment value to the other occupants of the house.